An analysis of the Korea-Qatar 2018 World Cup Qualifying encounter at Suwon World Cup Stadium. Note: I’ve tried to make this analysis more concise than in the past, and certainly less overly detailed/image heavy/rambling/repetitive. I failed. The starting line-up had a couple of surprises. From a Korean standpoint, it was a typical 4-1-4-1. 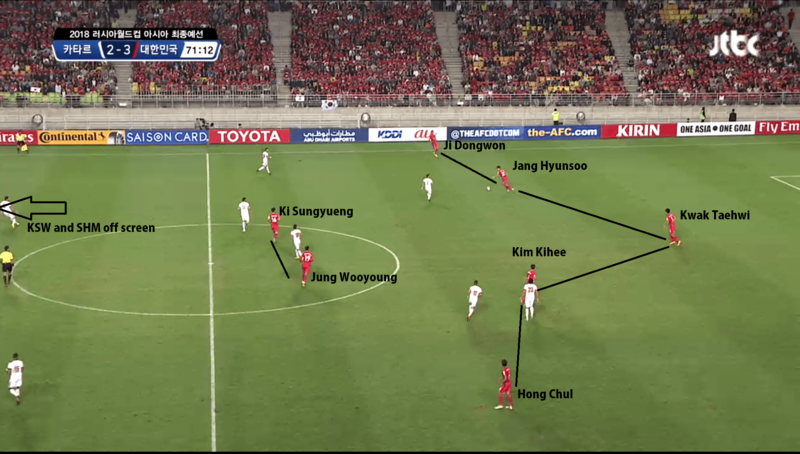 The backline saw the same central-defensive pairing of Hong Jeongho-Kim Kihee (this pairing played against China), and two fairly mobile fullbacks. On the left, Hong Chul, who loves to tear up the pitch, and on the right, Stielike’s staple Jang Hyunsoo. In defensive midfield, Stielike opted for more of a holding midfielder (Jung Wooyoung) instead of the defensive option (Han Kookyoung). Up front, it was an all Europe-based attack force, including Ji Dongwon dropping into the right wing and Suk Hyunjun up top for the first time since the Czech Republic game. On the Qatari side, the real shocker was their decision to drop into a 5-4-1. The Korean side weren’t really rattled, but this was a new shape deployed by new manager Jorge Fossati, so Stielike’s men had probably never seen that line-up in tape before. Qatar’s back five covers the door to the penalty box. Ji and Son (especially) stay very wide. Ki and Koo play above Jung Wooyoung, confirming the on paper 4-1-4-1. Qatar’s “wingers” in attack become very narrow in defense. There’s 10 men behind the ball at all times for Qatar. Korea started strongly on the front foot, moving the ball well, utilizing wide spaces and the middle of the pitch. Ki and Koo were shifting balls diagonally, there was a good dynamic down the left flank and the U-shape (passing the ball from one wide area to another, via the centre-backs) was far less pronounced. Jang Hyunsoo had an early effort sail high from the top of the box, and then later Jung Wooyoung hit an ambitious volley from deep. You’ll recall in our official preview, Jinseok lamented how seldom Korean sides took shots from deep – but in the first 10 minutes, Al-Sheeb was kept on his toes by long-range efforts. Perhaps this was singled out as a weakness for the Qatari keeper, or perhaps it was a product of Qatar’s midfielders just settling into their new defensive responsibilities. Nonetheless, Korea took their goal while Qatar’s midfield were still calibrating, and it was signed by Ki Sungyueng. But Son Heungmin had a big hand in it. Son’s obvious long-range threat and dribbling ability dragged Hassan Al-Haydos – normally marking Ki – over to Son along with the definitely Qatar-born right wing-back, Pedro Miguel. Son did a couple step-overs, shifted the ball to his right to an unmarked Ki… and I’ll let the pictures do the talking. Hassan Al-Haydos goes over to support his wingback against Son. 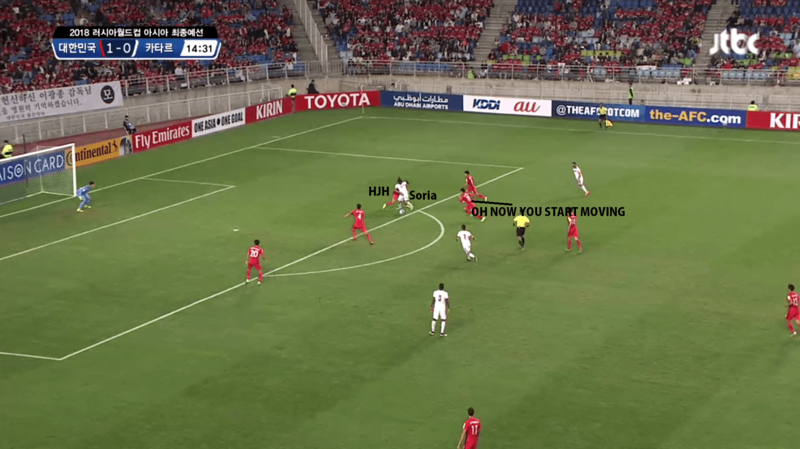 Al-Sadi doesn’t shift upwards to block Ki, leaving the Korean captain unmarked. Ki fires one low and spinning away from the keeper into the bottom corner. Korea 1-0 Qatar. A great finish. Almost Park Jisung-esque (he never blasted the ball, he always picked his spot). Ki picked his spot, got it though the glut of Qatari defenders and beat Al-Sheeb. Would a Buffon have stopped that? Of course, but this is Al-Sheeb. A well-taken shot, and the third long-range effort in 15 minutes finally found the back of the net. A key contrast (I’m getting the cheap pun out of the way) in the first half was how Korea looked before and after the goal. And a big part of that was Ki Sungyueng’s play. There were gaps and channels for Ki to run into in the earlier part of the first half, and it caused Qatar all sorts of problems. It’s Ki’s evasive movement that sees him squiggle out of the Qatari defenders pressing and play a throughball to Son down the left flank. Son realizes he can cut back to Ki, who’s continued his run into the box, followed but with space. Ultimately, Ki gets two cracks at a shot. Both are low shots with the right foot. The first one is blocked and the ball comes promptly back to Ki, and his second shot is barely saved by the legs of Al-Sheeb (who was diving the wrong way). In any case, Qatar’s defensive system’s wrinkles were exploited fully by Ki in the first 14 minutes and this double chance is a testament to that. Mere seconds after Ki Sungyueng’s great double chance, Qatar got their golden opportunity seemingly out of nowhere. A simple long-ball was the undoing. The Qatari keeper hit a long ball down the pitch, and it was the centreback Hong Jeongho, instead of defensive midfielder Jung Wooyoung, who went for the aerial duel with naturalized Qatari center-forward Sebastian Soria. Soria won, and the ball game to Hassan Al-Haydos. The Qatari captain, playing as a winger of sorts in this game, drew Hong Chul out of the backline. Al-Haydos got rid of the ball with one touch, and Hong, slow to react, is caught flat-footed by Soria’s turn and brings him down. Al-Sheeb’s goal kick is won by Soria in the aerial battle. The ball bounces out and Hong Chul (not KKH, like the image says, sorry) just pokes his foot at it. Jung Wooyoung (the DM) is ball-watching as the Korean defensive line loses its shape. Hassan Al-Haydos goes to chase the ball that Hong Chul poked at. Hong Chul naturally follows his man. Jung Wooyoung is still ball-watching. Oops. Al-Haydos hits a sneaky one-touch backheel and Soria has begun his run from the white circle. Jung Wooyoung is STILL ball-watching, doesn’t detect Soria’s run. Soria takes the ball on his left foot and tries to turn. Hong Jeongho’s body position is wrong as he overstepped a bit, opening himself up. Jung Wooyoung NOW FINALLY starts moving. In addition to Hong’s arm wrapped around Soria in an amicable embrace, there’s a late tackle from Hong as legs clash. Soria goes down. Penalty. Again, errors on the play. First off, Jung Wooyoung is AWOL on the play. Although he was only a couple meters away from Soria when the goal kick came in, he let Hong take on the aerial duel. Fine. But with Ki Sungyueng behind Jung Wooyoung to collect the ball, why wasn’t the lone defensive midfielder covering for his centreback in the defensive line? 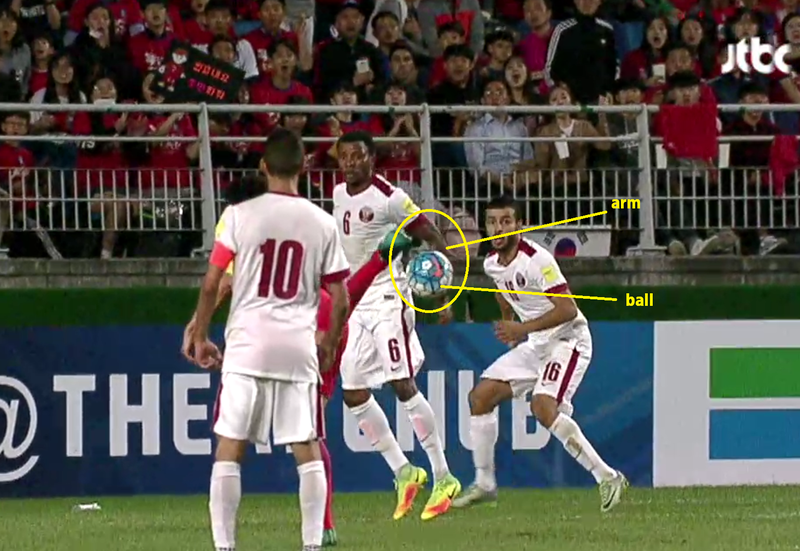 This error means Hong Chul’s botched clearance and poor body position on Al-Haydos (as he tries to push him out, but instead lets him hit a backheel) is far more alarming. Hong is caught flat-footed as Soria turns away from him. Was the contact enough for a penalty? Yes. He had his arm around him and there was a clash/rubbing of legs. No matter how “easily” Soria went down, there was contact. A penalty conceded out of nothing. Poor all-around. Al-Haydos sent the ball down the middle (I wonder if pointing which direction you think the penalty-taker is going to shoot actually tells the penalty-taker you’re jumping to one side). Against the run of play, on their first shot of the game, Qatar were level. Qatar are reinvogorated by the goal and the gap in possession (66-34 for Korea in the first 15 min) is reduced to 55-45. The Qatari attack essentially consists of 7 very mobile players – the wingbacks, the wingers, the central midfielders and Sebastian Soria. There is a fair amount of freedom of movement, though the creative spark/dynamic threat really only existed on the right flank. Hong Chul was caught out on more than one occasion when Hassan Al-Haydos and Sebastian Soria threatened. Jung Wooyoung, on more than one occasion, showed he was no Han Kookyoung. His slow-reaction time was a nuisance to his attempts to win the ball back, and his only helpful contributions in defensive midfield was being an object to pass around. More on Jung’s performance later. Korea’s attack was blunted by the Qatari midfield settling into their roles and Korea lost the space and the spark of the first 15 minutes. In a haunting flashback to the China game, Korea contented themselves with passing in a U-shape with no end product or breakthrough. Son Heungmin and Hong Chul were the only penetration Korea had. Rare vertical pass attempts from the centrebacks were often intercepted. Still, no one really saw the Qatar goal coming since neither side was creating quality opportunities. It’s a goddamn counter attack again. Suk falls over and loses the ball. And Qatar are off to the races. No Korean player properly confronts the Qataris. We can’t defend counters, it seems. Hong Chul is level with Soria when the pass is made to the forward, but he’s out run and soundly beat. Oops. Soria cuts in and looks ready for the kill… there’s alarmingly few Koreans behind the ball. Heroic block by Jung Wooyoung, but Ki, running back from midfield, crazily slide tackles late…. and right into Jung. The ball comes back to the top of the box. Al-Haydos receives a pass. Ki gingerly gets up. He and Hong are caught ball-watching, while Jung is still dealing with the fact Ki nearly killed him. Soria’s made a great run in behind the defence (again! he had a great game, got to be said.) Al-Haydos makes a one-touch flick pass. You know, putting your hands behind your back innocently isn’t supposed to work when the ball is going behind you. This is definitely hand-to-ball and a clear penalty. Who ever said MS Paint was useless? I made this pass map by tallying all the pass combinations and estimating the average positions of the players. I was trying to do something more accurate for the positioning of the dots, but I digressed. 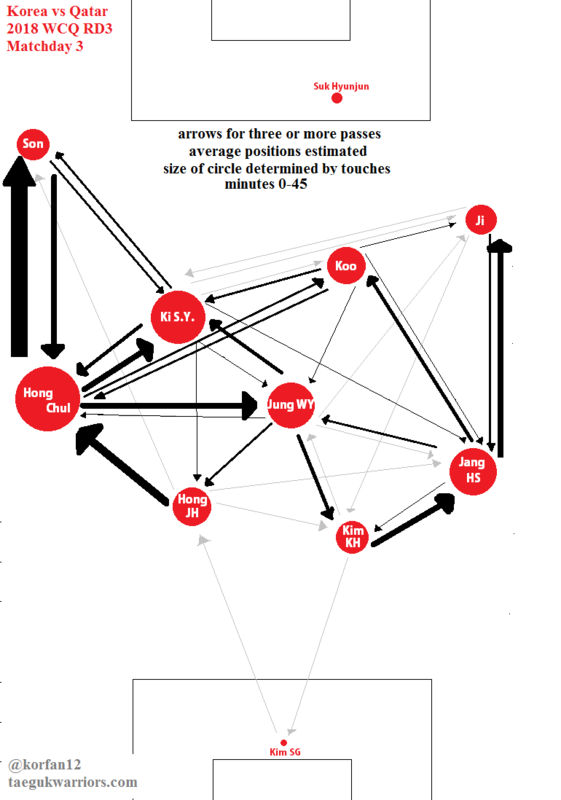 The size of the dots and arrows are proportional to how many times that pass happened/how many times a player “touched” the ball (pass received, pass made, interceptions, tackles, aerial duel wins). What this map tells us is all about that wing play and the importance of the full-backs. The strongest links on the pitch were between Hong Jeongho to Hong Chul, Hong Chul to Son Heungmin and Son Heungmin to Hong Chul. Although that arrow from Son to Hong points backwards, it’s important to note that because of the overlapping of Hong, that’s far from accurate. Furthermore, the fullbacks are the starting point of almost every attack. It’s a confirmation of what we’ve gotten used to accepting as Stielike’s KNT. You can also notice how Jung Wooyoung was really used as a “reset button” to Korea’s attack. His only forwards pass links were to Ki Sungyueng, and even those were lateral passes at best. Encouragingly, the middle of the pitch is used more than probably against China. 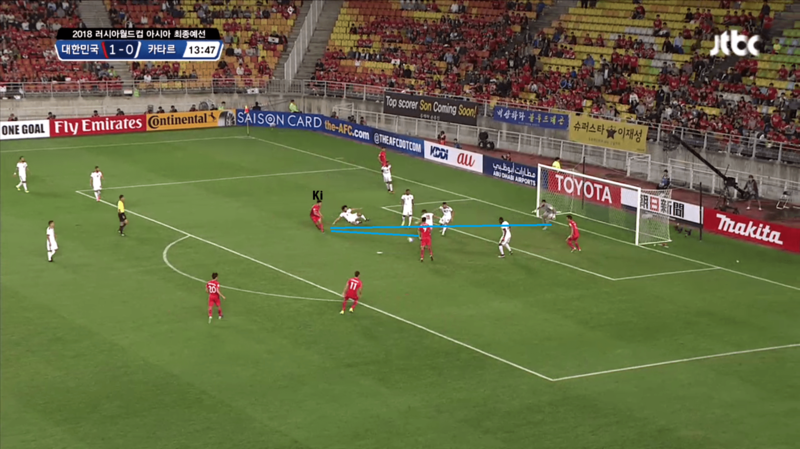 However, Suk Hyunjun is completely isolated up top, barely touching the ball all half long. TLDR; If in the first part of the first half, up until the penalty kick, Korea were in control and cruising, the second part of the first half was quite a different tale. Korea, blunted by the Qatari midfield, reverted to the comfortably confines of the U-Shape passing we saw against China, anemic in the middle of the pitch. Qatar used their speed and Soria’s strength to their advantage and got two goals that the Korean defense should have done better with. Stielike made a half-time substitution and brought on Kim Shinwook for Suk Hyunjun. Enter Plan B. We saw in the pass map how isolated Suk was. In truth, Suk’s only noteworthy thing in the entire half was his over-aggressive tendencies, which led to him picking up a yellow card. There wasn’t much mobile movement from Suk, and he didn’t like coming deep either, nor did he cause many problems in the air (save for one header over the bar). So the Wookie sub basically made sense. If we were going to try and bypass their midfield or put crosses in forever, then you might as well have a tall dude to aim at. His lack of mobility didn’t matter in this system anyways. This is a play Korea will have more or less chalked up. Hong Chul hits an early cross and Kim Shinwook’s aerial threat brings two Watari players over to the Jeonbuk forward. Kim wins out, however, and Qatar’s Kasola can’t clear the second ball. Ji Dongwon settles it down and thrusts his foot at it. A vital goal in the 56th minute. in the build-up to this goal, Ji is actually sticking around the left side – creating an overload. This simple confusion tactic might have led to the defensive mix-up in the box, where Ji literally wasn’t marked. The third goal came just a couple minutes later, in the 58th minute. Qatar still were patiently holding their defensive lines. Jung Wooyoung looked for an option, and it was Ki coming out to take the pass. As soon as Ki touches the ball, Son’s feet are moving and he’s made a great run in behind the Qatari defence. His one-time finish is flawless. 3-2. Hong gets his second yellow card (his first was the penalty concession). You can argue that this foul is entirely avoidable, as Hong actually gives away the ball cheaply out-of-position and fouls Soria while running back to his position. But, if you look at it closely, it’s barely a clip – Soria was looking for the foul here, 100%, and the ref fell for it, hook, line and sinker. The referee’s harsh double standard (he shunned fouls of a similar nature on Kim Shinwook) obliged the Koreans to see out the last 20 minutes with 10 men. After Hong Jeongho was sent off, Ki Sungyueng dropped in as centreback for a few minutes to allow for Kwak Taehwi to warm-up. When Kwak Taehwi came on the pitch, he was continuously holding up three fingers to everybody on the pitch. Yoo Sangchul predicted it correctly on the Korean JTBC broadcast, as Korea dropped into a 5-2-2/3-4-2 shape. Kwak slotted in as the sweeper/central centreback, while Ji Dongwon dropped in as the right wingback. Up top receiving the longball clearances would be Kim Shinwook and Son Heungmin. The midfield pairing responsible for pushing out was Ki Sungyueng and Jung Wooyoung. Don’t believe me? Korea, for the remainder of the game, did not seek to create an attack other than let Kim Shinwook/Son Heungmin try to figure things out on their own. It was all about seeing the game through to the end. Did it work? In truth, Qatar seemed life-less and without energy even before the tactical switch. Only Ji Dongwon was glaringly out of position, and it showed, unsure about where he should be positioned at first, then getting burnt and unable to cope physically. He was probably placed there for his stamina and energy, but Ji honestly can’t play the position when in this role (far more time defending than attacking). Although he coped, in hindsight, having one of Jung WY or Ki SY drop down and keep Jang Hyunsoo out wide would have probably been a better decision. Final score: Korea 3-2 Qatar. This referee was quite harsh on Korea, and as the home team you often expect to get the benefit of the doubt more times than not. There were moments where the referee was quite simply wrong, including the handball at the death of the first half, Hong’s second yellow card for barely pushing Sebastian Soria, Kim Shinwook being knocked over to no avail, Ki being booked for needing a stretcher after receiving an elbow to the face, Kimbo being barged over just after entering to no foul, etc. I can only imagine what would have happened if Qatar grassrolled! Presumably, nothing, because as objective I am trying to be, Korea was up against 12-men on certain occasions in this match, no doubt about it. Suwon World Cup Stadium knew it, and the pundits, commentators, bloggers all knew it too. Kim Seunggyu – 6 – Couldn’t do anything on either goal. Hong Chul – 6.5 – Brilliant going forward, terrible at the back. He’s a poor man’s Kim Jinsu. Hong Jeongho – 5 – I think the second yellow was harsh, but the penalty most certainly was not. Kim Kihee – 5.5 – The more invisible of centre backs, which usually is a good thing. His attempts to distribute the ball forward were lacklustre though. Jang Hyunsoo – 6 – His flank was the less busy one by far. Solid shift, really. Nothing too special about it. 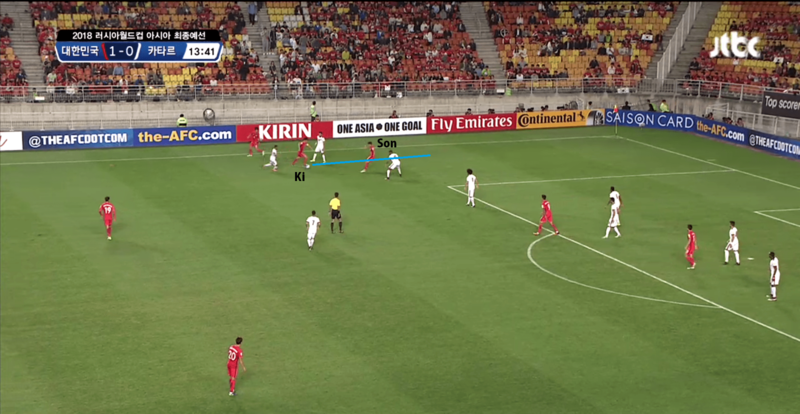 Son Heungmin – 7.5 – Great finish and menace constantly with Hong Chul down the left flank. Also put in a shift despite injury in the 5-2-2 near the end. Should have come off sooner than the 86th to get that checked out. Ki Sungyueng – 7.5 – My man of the match with one goal and one assist. First half, ran into seams and diagonal balls to fullbacks… Second half, deeper role often. Great shift, cool passing, tauntingly dangerous though. Ji Dongwon – 7 – Wow, he’s hit form too. Tidy finish, brave shift as wingback, energetic, tireless, hard-working, reliable. I liked this game from Ji. Suk Hyunjun – 5.5 – Over-aggressive, invisible, rusty. Kim Shinwook – 6.5 – His unofficial assist on the second goal is exactly why he was called up. That play alone should mean he’ll be here in November. Kwak Taehwi – 6 – Reassured an unsettled back-line after Hong’s sending off. Leader. Kim Bokyung – NR – But energetic and brought some running and pressing to the end of the game. Should have come on a bit sooner though. Can We Beat the Azadi Jinx? That is the question The Tavern will seek to answer in the coming days until our Tuesday friendly. Messy defensively, formidable in attack though often times uninventive. Korea has questions to resolve still, but 3 points is 3 points. This first come-from-behind win under Stielike is a positive sign of renewed confidence and mental toughness, but what’s really missing is an assured defensive performance… And a clean sheet. Now where did all of those go? good job for winning but we honestly needed better defense. Korea has never beat Iran at Tehran apparently. Maybe they could change that up. I wish Korea could stop losing 1-0 and win for a change. Korea, good luck! Improve your defense and score an early goal! btw guys, I’m so glad you guys have forums here. I’ve read a lot of interesting stuff thanks to them. Keep up the good work. It has been 48 years since we won at the Azadi Stadium I believe. So we’ve done it before. Just like, not in most of our lifetimes lol. And we’re glad you like the forums! Just kidding. We’ve actually never won in Iran. wow! Fantastic analysis,Tim! summed up with nice graphic pass map, too! Well, we shouldn’t be getting ahead of ourselves after 4 games, but yes, 10 points in 4 games with Iran away is a very, very positive record. Both sides know how crucial this game is. A win is vital. Realistically though, KNT fans should be happy with a stalemate.